Is Oaxaca Safe in 2008? Yes. Please don’t hesitate to travel to Oaxaca. It is perfectly safe and easy to get to and get around in. The Zocalo is full of strolling visitors, flowers, music and balloon vendors. The main thoroughfares are open to easy pedestrian strolling. There are no encampments of demonstrators like there were in 2006. Recovery from these tragic and unfortunate events has been slow, and unfortunately public perception around these events has persisted even though the events dissipated long ago. Artisans and artists comment to me about the slowdown in tourism and how their livelihood has suffered. Fewer people from North America and Europe are here to purchase their beautiful handicrafts and artwork. Even with the devalued dollar, your tourist dollar goes far in Oaxaca and the archeology, art, history and cultural experience is unparalleled. Please don’t hesitate to come here because of safety. It remains a non-issue. Today we had comida at El Descanso in Teotitlan del Valle. 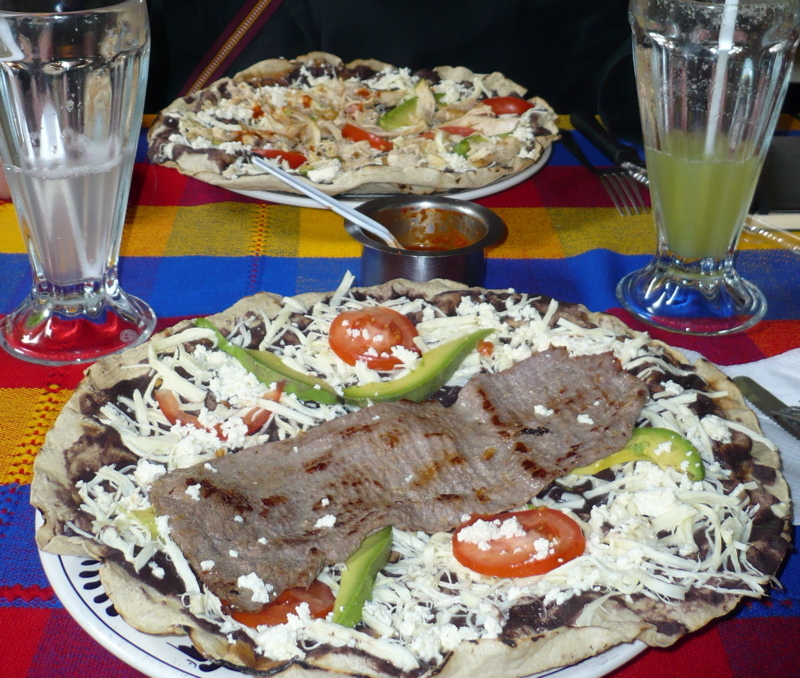 They make a great Tlayuda (sometimes spelled Clyuda), which is an extra large crispy flour tortilla smothered with great stuff and resembling the thin-crusted pizzas one gets in restaurants in Rome. You eat it open face, cutting it with a knife and fork or tearing off pieces and folding it over just like pizza. It makes a delicious and fast meal. We ordered these and aguas frescas de pepino (cucumber) — a cool beverage of cucumber juice mixed with water, lime juice and sugar. Muy delicioso! Spread the tortilla completely with the black bean paste. Evenly distribute the cheese over the top, then do the same with the chicken pieces, onions, tomato and avocado. Drizzle with salsa. Heat under broiler for 5 minutes or until cheese melts and chicken is lightly browned. One tlayuda will serve one person. Optional additional ingredients: diced peppers, diced pineapple; substitute pork or beef for the chicken. Alert: Rainy Season! We’re getting lots of rain in Oaxaca now. Great for planting season but inconvenient for hot-footing it around town, unless you duck in for an afternoon mezcal, beer or coffee mocha 🙂 Come prepared. A grueling travel day is coming to a close. As much as I plan ahead and start way in advance on the packing ordeal, somehow, I can’t seem to complete it before the 11th hour, and that’s exactly when we went to bed (you notice I didn’t say “to sleep”). The alarm was set for 2 a.m. so we could leave the house at 3 a.m. to arrive at the airport by 4 a.m. to be there with enough breathing space for the 2-hour requirement to show up for the international flight. All in all, everything came off without a hitch, including primo space in the park’n ride lot. Continental does not charge for baggage as of this writing. I took the largest suitcase I own and crammed it full of recycled good clothing to give to villagers, as well as the essentials for a Oaxaca Summer Vacation. It’s 84 degrees, clear skies with great pillows of cumulus clouds, breezy and hot. Definitely high desert sunglasses and sunscreen weather — good for dressing light and comfortable. Evenings definitely cool down to high 50’s-low 60’s; a sweater and shawl are definitely needed. We’re not going to the beach this trip, so I didn’t pack a bathing suit. Sundries and Toiletries: Tylenol, Purell (to carry at all times), travel size shampoo, lip gloss, sunscreen (SPF 55), deodorant, echineacea, sunglasses, toothbrush, toothpaste, moleskin, cortisone cream, bandaids, antibiotic topical gel (you never know when you might need this), and prescription medication (be sure to get these filled several days in advance). Tip: Call your cell phone service provider to get extended coverage for Mexico. It’s well worth being able to stay in touch with spouse or traveling companions should you decide to split up and meet later! Calls are costing us 65 cents per minute, so we’re careful. I pack heavy because I cram in lots of good used clothing (careful not to exceed the 50 lb. limit) that I bring to give away to families in need, and then that frees up space for the trip home when I have room for any special purchases. I also pack plenty of bubble wrap (saves expense on this end) and a roll of packing tape. I usually will purchase a large handwoven basket at the local market, put it inside my suitcase, and then put the bubble-wrapped fragile piece of art inside it for extra protection. For the cover, I use a woven round tray. Everything I have packed this way in the past has arrived home in one piece without the expense of paying for special packing and shipping. If not, you’ll just have to come to Oaxaca to see the exhibit for yourself 🙂 The cover design is from a tapestry woven by Roman Gutierrez of Teotitlan del Valle. He weaves in the Saltillo style, 22 threads per inch. I have been to his studio/workshop and can attest to the fact that his work is masterful. He also has a commitment to cultural sustainability by teaching village young people traditional methods in order to preserve ancient Zapotec weaving and dyeing techniques. I’m not sure about that! Oaxaqueno artists are VERY creative. In Teotitlan del Valle and throughout the Oaxaca Valley master weavers produce extraordinary art pieces that are created from the mere fibers of sheep wool and cotton plants. Designs are intricately detailed, as you can see below. And, even the smallest piece can take hours to create. 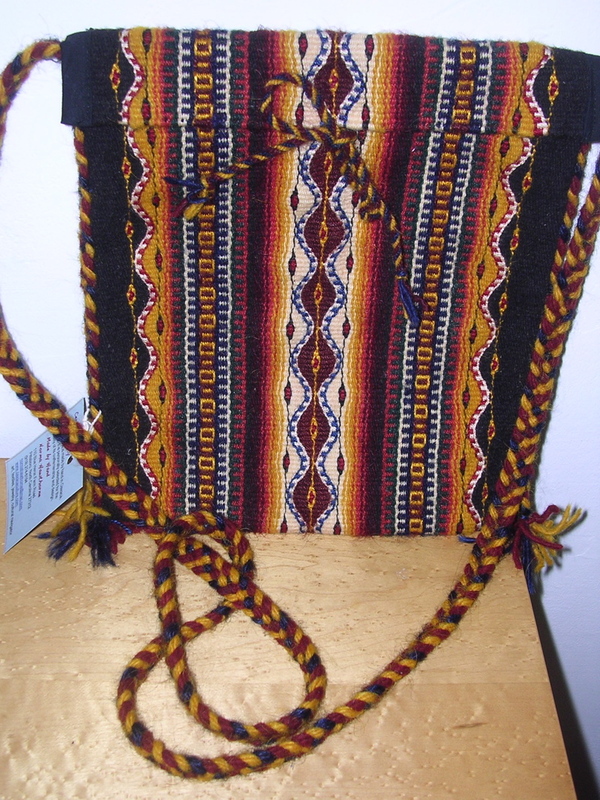 The detail of the shoulder bag (below left) is in the saltillo weaving style that employs 22 threads per inch. This piece is a combination of naturally dyed wool and silk weft on a cotton warp. 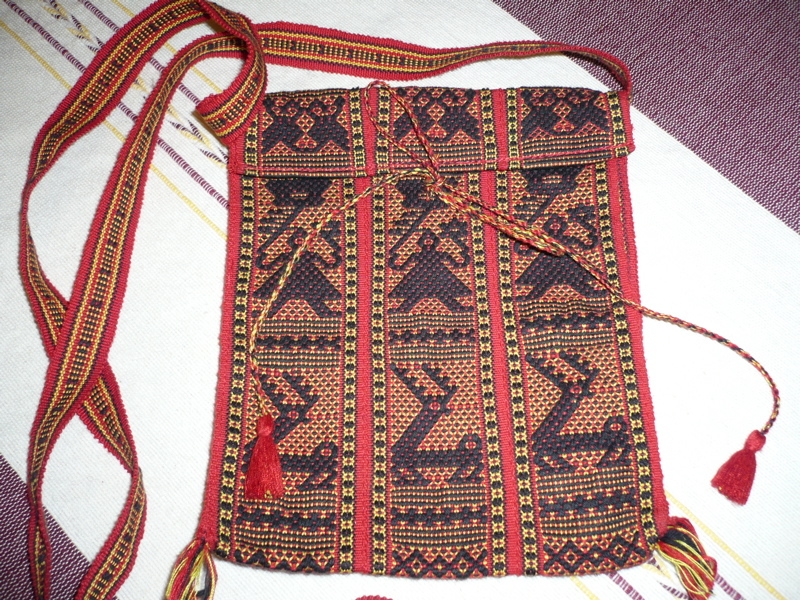 The red piece below is produced on a backstrap loom in the village of Santo Tomas Jalieza, a village off the main road to Ocotlan. It is a must stop, even if you only have time to spend 30 minutes at the central market. Backstrap weaving is women’s work, something Zapotecs have been doing for over 6,000 years. 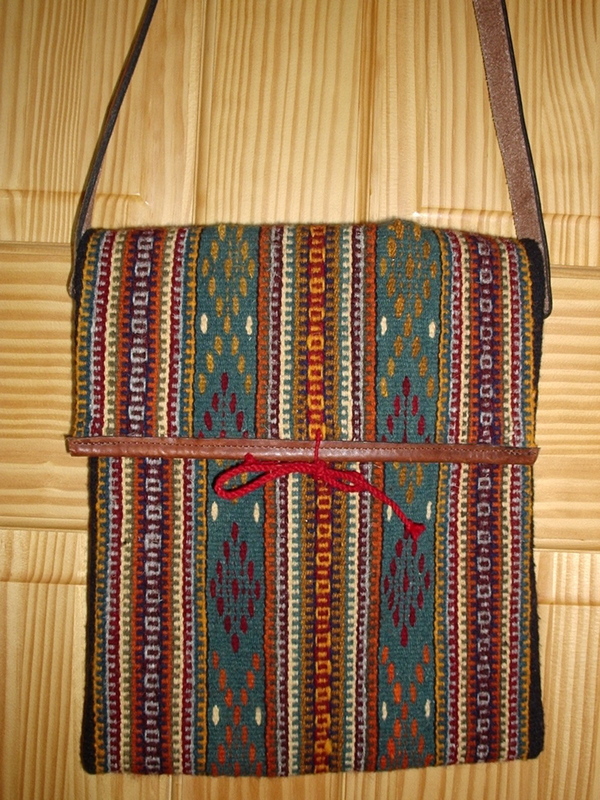 Look at the fine detail of this all cotton shoulder/book bag. It is s very sturdy weave. Love birds and feathered dancers are common images. Look for pieces that are tightly woven using fine threads. They will cost more but endure longer . These pieces are in my personal collection. 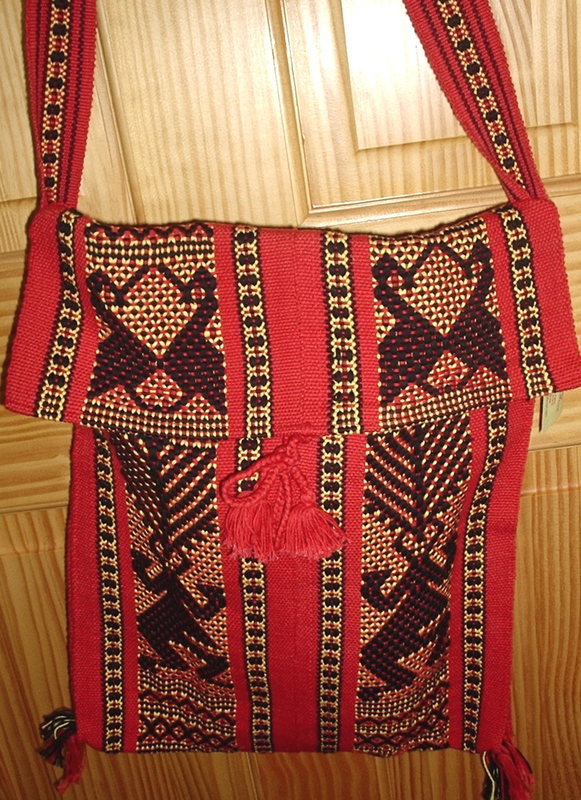 The bag on the right (above) is a fine tapestry weave created by Josefina Mendoza. I took the piece to Luis and Licha at Casa Santiago on Ave. Benito Juarez in Teotitlan and asked them to add a long leather strap and leather gusset. Their leather craftsmanship is exceptional. 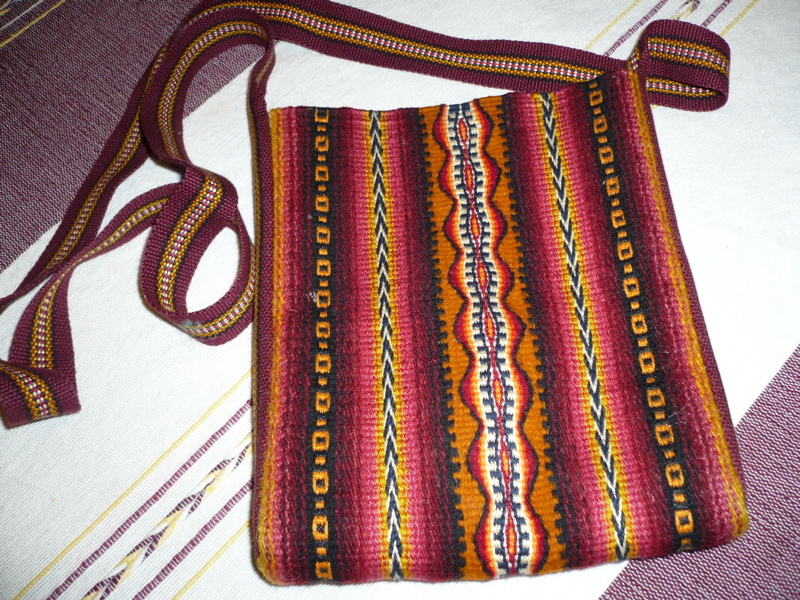 The handbag shown below (left) is a very small over-the-shoulder mini-pouch made on a backstrap loom in Jalieza. It is a much finer “sister” to the one shown above left. You can see the detail of the weaving patterns … 3 designs to the row instead of 2 with a lot of intricacy. The bag with the geometric design next to it is 100% silk, and the center wavy row is embellished with silver threads … yes, real silver. I love these two really small bags … they are perfect for holding ID, coins, bills, and a credit card or two.